A fully loaded Trek 420 touring model early during Monte Lowrance's quest to bike solo across the nation and touch all 48 continental states, plus Washington, D.C. Lowrance struggled through the first month with the load, which weighed upwards of 50 pounds, before meeting a couple on the west coast that loaned him a bob trailer for the final nine months. 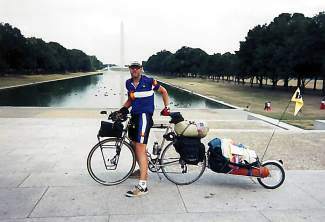 Monte Lowrance stops for photos at the National Monument in Washington, D.C., when he was a little over halfway through a cross-country solo bike trip in 1997. At the time, the Pueblo native and longtime Summit County resident was 45 years old, recently divorced and in need of a biking experience unlike any other. 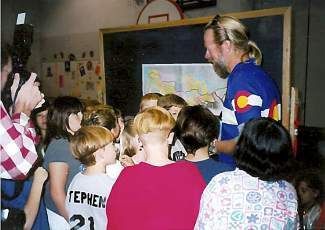 Monte Lowrance (blue jersey) talks with elementary school students shortly before finishing his cross-country solo bike tour in 1997. 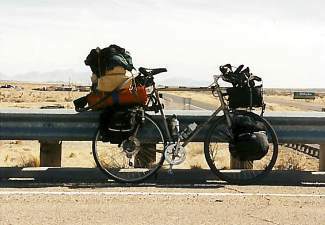 The longtime Summit County native hit all 48 continental states and visited about a dozen friends during the 10-month journey covering 11,800 miles. 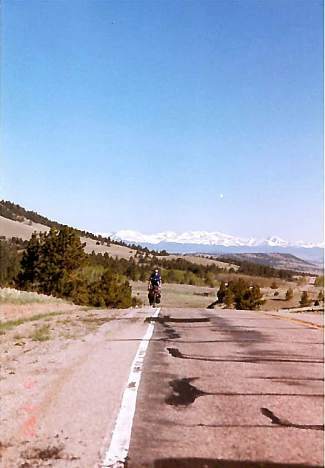 Monte Lowrance rides a deserted stretch of Utah with the Rocky Mountain in the background during a cross-country solo bike trip in 1997. The trip took him about 10 months total and touched all 48 continental states. The cross-country rig Monte Lowrance rode in the late '90s for 10 months, beginning in Texas and ending in Colorado after looping through all 48 continental states. Lowrance often stayed at youth hostels in the cold months and camped on roadsides in the summer, with plenty of time to think about motivational mantras like this one on the west coast. It was an itch he couldn’t quite scratch. In 1997, Pueblo native Monte Lowrance had just left his job of 15 years and was recently divorced from his wife. He’d been living in Summit County since 1975 and working full time since 1983, when he was hired as controller for the accounting firm that oversaw Breckenridge Ski Resort, Keystone Resort and Arapahoe Basin Ski Area. Vail Resorts (then Vail Associates) paid him a severance when it took over, and, at 44 years old, he felt listless. This wasn’t exactly a spur-of-the-moment decision, nor was it a typical mid-life crisis, like buying yet another toy: a Harley, a Porsch, maybe a boat. No, he had enough of those, and since college, Lowrance had been an avid road cyclist. His ex-wife, Janet Anne, bought him a Trek 420 touring bike shortly before their divorce and he often spent lunch breaks pedaling through the cool, crisp air around Lake Dillon. For months before the trip, Lowrance devoured books about travel and bike touring. He and Janet Anne went on a multi-day ride in France a few years prior and he found plenty of inspiration in Barbara Savage’s 1983 memoir, “Miles from Nowhere: A Round-the-World Bicycle Adventure.” But a global bike tour didn’t fit his plans — “I decided I really didn’t want to do that because I wasn’t really a good bike mechanic,” he says — and so he opted instead for the trans-America ride. That was all it took. After a month or two on his sister’s farm in Pueblo, he caught a ride with his parents to Texas in January 1998 for the first leg of his journey. At the time, he knew little about the route he would ride, other than he expected it to take anywhere from 2 to 20 years — time to truly enjoy the road and wherever it took him. On Jan. 15, 1998, he left southern Texas and rode west, passing through New Mexico, Utah, Arizona and Utah en route to the California coast. 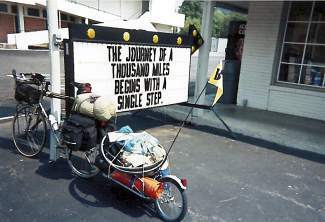 The first few hundred miles were smooth enough, but, after about 10 days on the road at a pace of about 80 miles per day, he started getting discouraged. His bike was loaded to the brim with gear, all of it lashed to front and rear racks his brother, a metal worker, had fashioned just for the Trek 420. He was popping spokes constantly and it was slowing him down. After 3,000 miles of struggling with the load, Lowrance had his first chance encounter when another couple touring the country loaned him a bob trailer. He unloaded the racks, packed the trailer and set off, now feeling more confident about the next few months — or years — of his tour. He was still committed to looping the country, with stops in all 48 states, but the 20-year plan didn’t seem as appealing. Armed with a road atlas — this is before cell phones and computers and Google Maps — he touched Oregon and Washington before turning east. Most nights were spent in hostels or camping on the roadside, with only the occasional hotel stay when weather turned nasty. As the miles added up — Montana, Wyoming, North and South Dakota, the Great Plains — Lowrance found a comfortable pace, physically and mentally. A second chance encounter at a hostel left him with an audio recorder, and he started recording his musings for a 2001 self-published book, “Wide Hips, Narrow Shoulders: A Bike Touring Adventure.” His mind wandered constantly, from religion to politics to his recent divorce. Lowrance pedaled on through the Midwest — “Once I got east of Colorado I just couldn’t figure out how people lived in the heat and humidity,” he says of spending the early summer months in the country’s core — and eventually reached the East Coast. Occasionally, he would look up old friends and extended family for a week of downtime, but, after a rest, it was back to the bike and trailer. Heat aside, the weather that summer was nearly perfect. He hardly had an issue with the elements until he reached the Deep South — right as Hurricane George hit the Gulf of Mexico. He quickly passed through, pointing north to St. Louis after about eight months of riding. On Nov. 7, 1998 — 10 months, one birthday and 11,800 total miles after leaving Texas — Lowrance rolled over the Colorado state line and returned to Summit County. So many people and chance encounters had helped him along the way, but he still credits regular calls with his ex-wife for making it all come together. The two are still good friends. And, in the spirit of biking, she still is. Lowrance was diagnosed with dementia shortly after a bike wreck in 2012 and admits he’s now slowly feeling the effects: occasional confusion, a loss for words, trouble with new faces and places. But the bike is still there.